So nowadays, I wanna produce capcom cute cabinet. I want to make it exactly the same. It will be metal as original. But I need this cabinet's dimensions. But it has to be identical as original. The post was edited 1 time, last by hursit ( Mar 18th 2018, 7:09pm ). 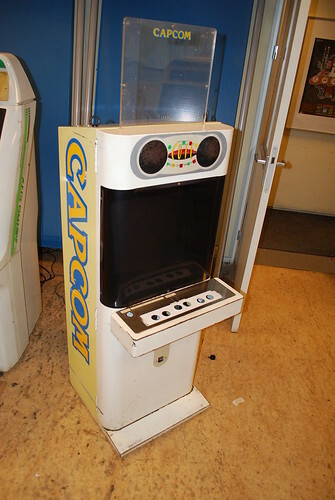 The CRT, it was a special JPN 18" version, I'm not even sure what the USA conversion would be (if one exists). Japan measures monitors from tube edge but America from display edge. The smoked black curved plexiglass bezel/monitor cover. I don't know how you will ever recreate/source this part. Paging @rewrite (the only person I know who owns one). Yes you are right I cannot find exactly the same CRT. But I will use some TV model that is 50cm. Original is 47 CM Tube. And the plexiglass can make flexible with hot air. I made it before. it won't be easy I know but I think I can make it. Oh man, cant wait to see how this project goes. I've actually been working on the same project, except scaled up about 1/2" to accommodate a standard 19" monitor. With mind to have several produced so that all sorts of folks could enjoy them. Seeing as we're on opposite continents I don't imagine we'd be stepping on one another's toes, so yeah, give me a bit and I'll try to get you all the dimensions in some form better than the chicken-scratch hand-drawn notes that I used for myself. If I forget, by all means, please PM me. Because I do forget about things. I just started to project. i have only the whole dimensions of the cabinet. I don't have any detailed dimensions. Very cool, would be awesome to see these made/fabricated. I would love to have a scaled down accurate fully working desktop version. Little 4:3 aspect LCD screen, single player panel with 24mm Sanwa buttons/Seimitsu LS56 stick and Raspberry PI inside. I'd call it the "Micro Cute" (stealing all the original artwork and reworking it slightly) haha. I would love to have a scaled down accurate fully working desktop version.Little 4:3 aspect LCD screen, single player panel with 24mm Sanwa buttons/Seimitsu LS56 stick and Raspberry PI inside. I'd say the biggest advantage in using a LCD the same size (or as close as possible) to the original Cute is that LCD panels in this size range are still made in 4:3 aspect ratios. Again I would want it as close to the original as I could, and all the games I would want to play (90's Capcom fighters) wouldn't need/use the 16:9 aspect anyways (aka swapping CRT for LCD should be both possible and easy). The post was edited 2 times, last by jassin000 ( Mar 22nd 2018, 3:03pm ). I'd say the biggest advantage in using a LCD the same size (or as close as possible) to the original Cute is that LCD panels in this size range are still made in 4:3 aspect ratios.Again I would want it as close to the original as I could, and all the games I would want to play (90's Capcom fighters) wouldn't need/use the 16:9 aspect anyways (aka swapping CRT for LCD should be both possible and easy). Thanks for you information by the way. I will decide on next days I think. CP measures: 18 1/16"x 5 1/4", and is rounded on the bottom a bit. There's an NOS CPO on YAJ that's gone by like six times. I've half a mind to buy it to have someone reproduce them, but I think the market's way too small. Plus, I have 23205723058 other project ideas, but limited time/resources. Maybe @rewrite can take lots of pics and measurements for you. Also, you should try to get some of the original parts like the CP, etc..
CP Box dimensions: 19 5/8"W x 6 3/16"D and 2 15/16"H.
Speaker grills are exactly 4" in diameter. Marquee is 13 5/6" wide and perfectly centered, cabinet at top where the marquee goes in is 19 11/16" wide. The CP's usually pop up pretty cheap. I want to say the last several were under $200. I'll keep getting dimensions over the next little bit here. Thanks for your information. It is great info. But if you ok lets go step by step. I will upload some pictures every time and you can tell me the dimensions when you have time. You can see some arrows Red And Black. Firs I need those dimensions. But if you ok lets go step by step. I will upload some pictures every time and you can tell me the dimensions when you have time. Let me go buy a metric measuring tape, I think that will be easier in the long run. I'll get the rest of the CP done today for certain.